The first season of Star Trek: Discovery split fans and general audiences almost down the middle. Some people didn’t think that it felt enough like a Star Trek series while others found its slightly different take to be a refreshing spin on an established sci-fi formula. I enjoyed most of the first season mainly thanks to the Mirror Universe story but it did take a few episodes to get going. The Klingon war was ended and so the programme makers are left with a clean palette to tell a new story. We were introduced briefly in a way to Captain Pike (Anson Mount) at the tail end of the first season – Enterprise hailed the Discovery – and so obviously he was set up to play a major role in the second season. 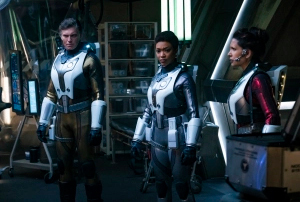 So season two sees the return of former criminal Michael Burnham (Martin-Green), Saru (Doug Jones) and Ensign Tilly (Wiseman) with Pike now sitting in the captain’s chair. The second season debut opens up with us flashing back to see Burnham being introduced to her foster brother Spock on Vulcan. Obviously this is a major set up and foreshadowing for the rest of the season. Pike is on board to assist Discovery in solving the mystery of seven red signals which have appeared across the universe. So instantly the make up of the crew is different to what we saw in the first season. 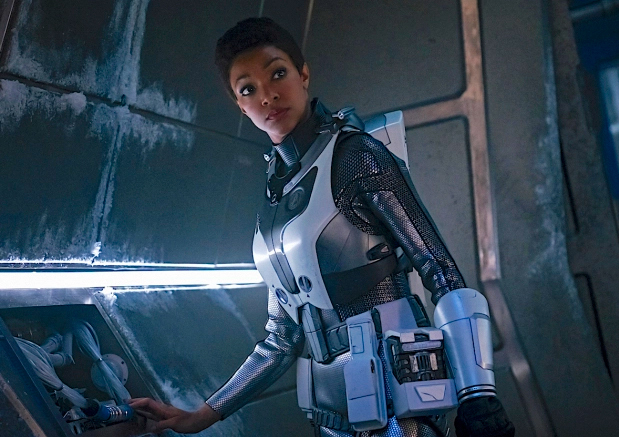 Sonequa-Green has evolved as Burnham as has Jones as Saru and the presence of Mount as Pike, who was played by Jeffrey Hunter back in pilot The Cage in 1966, really adds to the mix. We have a captain here who couldn’t be less like his predecessor Lorca. He radiates humanity and strength and we get some nifty chemistry between Pike and the rest of the crew. Anthony Rapp, who plays Lieutenant Paul Stamets, is still suffering from the death of his lover Dr Culber (Wilson Cruz) and so he may be departing the ship. We also get to see stand-up comic Tig Notaro as Jett Reno, a Starfleet officer who has crash-landed but managed to keep her injured crew alive. Notaro lends an extra sense of fun and adventure to proceedings too. This episode feels a lot more like classic Trek than most of the first season and Mount was an inspired choice for Pike. Wiseman, as the continuing comic relief here, is still a little bit annoying but humour has always been a major part of Star Trek. We don’t see Spock (Ethan Peck) in the episode but his presence is very much felt. In fact, the pilot episode contains a lot of warmth and humour and it augurs very well for the rest of the season. Star Trek: Discovery did take some of its first season to find its feet bur arguably, the premiere episode of season two has moved things up several notches and it makes you want to see what happens next. It is a worthy part of Star Trek canon and it will be interesting to see if they can keep the quality up across an entire season. Why still the hate for Discovery?